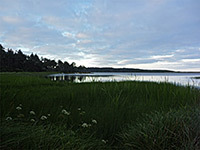 The little visited Floras Lake State Park occupies one of the more remote parts of the south Oregon coastline, where US 101 runs several miles inland, separated from the ocean by forest, meadows and lagoons. The park is entirely undeveloped, though the north end adjoins a county-run campground, beside the lake, which is wooded on three sides but bordered to the west by a thin line of dunes, at the edge of a long sandy beach. 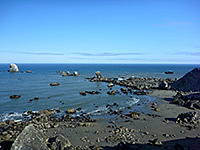 This extends northwards for 15 miles (outside the state park), all the way to Coquille Point at Bandon, and for 2 miles south; this a much more scenic section since the sands are bordered by a line of colorful sandstone cliffs. Walking down this beach is one option for hiking in the state park, though the most spectacular location lies further south, beyond the cliffs, reached by a 1.5 mile trail through thick coastal woodland. This is Blacklock Point, a grassy promontory between steep, rocky hillsides that drop down to a beautiful, unspoilt, dark sand beach, dotted with many rocks, large and small. 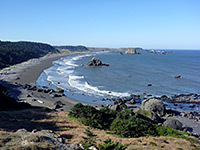 There are several tiny islands a little way out to sea, sheer cliffs to the north - the end of the line extending from Floras Lake, and more sand to the south, stretching 2 miles to the Sixes River and Cape Blanco. 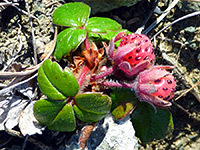 The beauty is enhanced by the general remoteness and the contrast with the lush forest just inland, where the trees mingle with ferns, rhododendrons, mushrooms, strawberries, orchids and other varied plantlife. There is no charge for entry to the state park, and the point is a good location for free camping, in a tent at the edge of the forest, close to the ocean. The accessible part of the state park, to the north, is reached by a quiet backroad heading west from US 101, ending at a wooded, partly residential area next to Floras Lake, including a bed and breakfast establishment and a 34 site campground (managed as Boice Cope County Park). Activities in the vicinity include fishing, boating, windsurfing, and hiking; a trail crosses an overgrown area around the lake's exit channel then winds through grassy dunes, reaching the beach after a quarter of a mile. The scenery is then little changing to the north, where the beach is soon bordered by the south-north flowing New River, but more interesting in the other direction, since the land rises a little, first to sandy bluffs then to the sandstone cliffs that become gradually higher further south. Several sheer-sided promontories prevent walking all the way to Blacklock Point, except perhaps at low tide, though this journey ought be possible via the Coastal Trail, however some parts are ill defined and not often used. Instead, the point is reached by first driving along Airport Road, forking off US 101 just north of Sixes, and dead-ending after 3 miles beside Cape Blanco Airport. A short track leads to what was a good free camping location in a clearing in the surrounding forest, unlike most other roads hereabouts that have no suitable stopping places; in 2014, however, a No Camping notice was installed by the state park service. From here, Blacklock Point is 1.5 miles away, along a wide, easy-to-follow trail.
. It crosses a small stream and reaches a junction; the Coastal Trail is right, leading north towards Floras Lake, while the Blacklock Point route is left, encountering similar scenery for another 0.4 miles to a second junction. 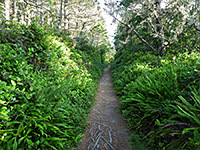 Turning right, the path to the point enters a darker section of the forest where the trees (Douglas fir) are taller and the undergrowth less - good habitat for many kinds of mushrooms - then climbs a little, passing the primitive camping site and emerging from the woods to a grassy promontory overlooking the Pacific Ocean. 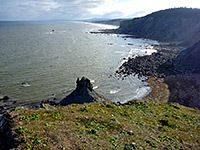 A steep-sided ravine is visible to the north, ending at an isolated beach at the south end of high sandstone cliffs, while more gentle slopes extend south and west, allowing an easy climb down to the shoreline. There are many rocks and islands around the point, but mostly just sand further south; a wide, litter-free expanse continuing for two miles to the mouth of the Sixes River. 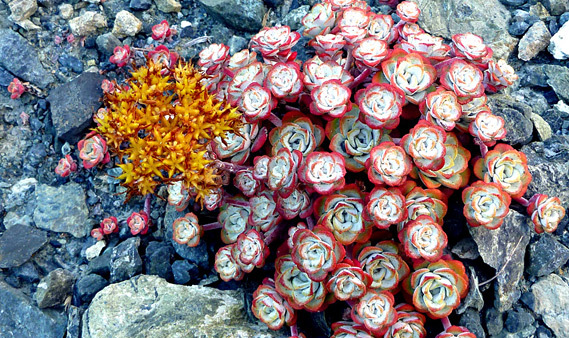 The intertidal rocks are covered by seaweed and mussels, plus colorful sea stars, and the grassy bluffs are home to several species of succulents (sedum), which display a variety of brightly colored flowers in summertime.